The goal of Design for Active Childhoods is to raise awareness about the role of the physical environment for healthy development and children’s active living. Think back to when you were four, five, or six years old. It is likely some of your fondest memories are of the outdoors. Do you still remember what you used to do outside? 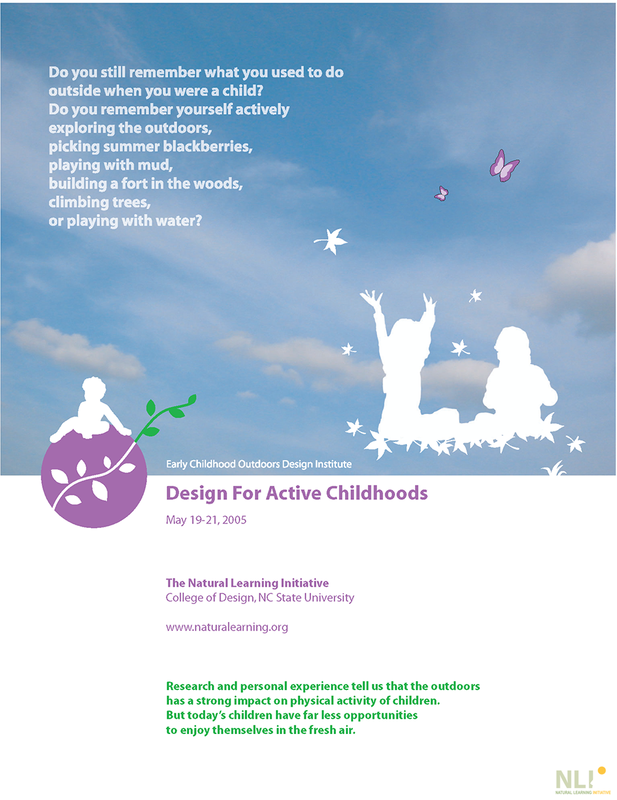 Do you remember yourself actively exploring the outdoors, picking summer blackberries, playing with mud, building a fort in the woods, climbing trees, or playing with water? Research (and personal experience) tell us that the outdoors has a strong impact on physical activity of children. But today’s children have far less opportunities to enjoy themselves in the fresh air. Thomas Barrie, AIA, Director of the School of Architecture, College of Design, NC State University. The Role of Design. Lori Little, Director of Bright Horizons Family Solutions Child Development Center at GlaxoSmithKline, Research Triangle Park, NC. How Children’s Behavior Changed after the Renovation of the Play Areas. Preschool Outdoor Environment Measurement Scale (POEMS) development team. Karen DeBord, PhD, Associate Professor, Department of Family and Consumer Sciences, NC State University; Linda Hestenes, PhD, Associate Professor, Department of Human Development and Family Studies, UNC-Greensboro; Robin Moore, Professor of Landscape Architecture, Director, Natural Learning Initiative, College of Design, NC State University; Nilda Cosco, Education Specialist, Natural Learning Initiative, College of Design, NC State University; Janet McGinnis, Program Consultant, More at Four Pre-Kindergarten Program. Measuring Quality: Preschool Outdoor Environment Measurement Scale (POEMS). Rodney L. Swink, FASLA, past president of the American Society of Landscape Architects. Welcome Session. Betsy Thigpen, MSc, visiting scholar at the NC State University, College of Design. Head Start Growth and Readiness in the Outdoor World HS-GROW.